Citation Information: JCI Insight. 2019;4(4):e125853. https://doi.org/10.1172/jci.insight.125853. BACKGROUND. Simultaneous noninvasively recorded skin sympathetic nerve activity (SKNA) and electrocardiogram (neuECG) can be used to estimate cardiac sympathetic tone. We tested the hypothesis that large and prolonged SKNA bursts are associated with temporal clustering arrhythmias. METHODS. We recorded neuECG in 10 patients (69 ± 10 years old) with atrial fibrillation (AF) episodes and in 6 patients (50 ± 13 years old) with ventricular tachycardia (VT) or fibrillation (VF) episodes. Clustering was defined by an arrhythmic episode followed within 1 minute by spontaneous recurrences of the same arrhythmia. The neuECG signals were bandpass filtered between 500–1000 Hz to display SKNA. RESULTS. There were 22 AF clusters, including 231 AF episodes from 6 patients, and 9 VT/VF clusters, including 99 VT/VF episodes from 3 patients. 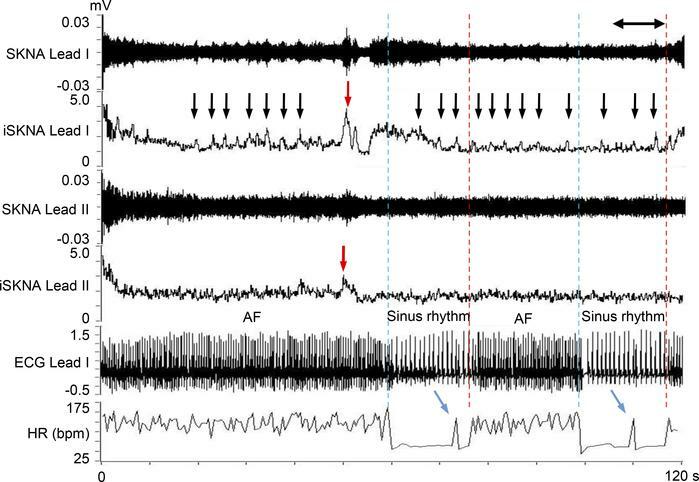 A total duration of SKNA bursts associated with AF was longer than that during sinus rhythm (78.9 min/hour [interquartile range (IQR) 17.5–201.3] vs. 16.3 min/hour [IQR 14.5–18.5], P = 0.022). The burst amplitude associated with AF in clustering patients was significantly higher than that in nonclustering patients (1.54 μV [IQR 1.35–1.89], n = 114, vs. 1.20 μV [IQR 1.05–1.42], n = 21, P < 0.001). The SKNA bursts associated with VT/VF clusters lasted 9.3 ± 3.1 minutes, with peaks that averaged 1.13 ± 0.38 μV as compared with 0.79 ± 0.11 μV at baseline (P = 0.041). CONCLUSION. Large and sustained sympathetic nerve activities are associated with the temporal clustering of AF and VT/VF. FUNDING. This study was supported in part by NIH grants R42DA043391 (THE), R56 HL71140, TR002208-01, R01 HL139829 (PSC), a Charles Fisch Cardiovascular Research Award endowed by Suzanne B. Knoebel of the Krannert Institute of Cardiology (TK and THE), a Medtronic-Zipes Endowment, and the Indiana University Health-Indiana University School of Medicine Strategic Research Initiative (PSC). Representative neuECG recording of an IRAF episode. These recordings were performed using standard skin patch electrodes. Consistent with that reported in a previous manuscript (9), large bursts of SKNA (red arrows) were associated with AF termination. There were 2 consecutive IRAF episodes that occurred within 60 seconds (s) of the prior episode of AF. Each episode was preceded by a premature atrial contribution (blue arrows). Small bursts of nerve activities (black arrows) were seen multiple times during the recording. The onsets of AF are indicated by red dotted lines, and the terminations of AF are indicated by blue dotted lines. SKNA, skin sympathetic nerve activity; iSKNA, integrated SKNA; AF, atrial fibrillation; ECG, electrocardiogram; HR, heart rate.